Do not carry heavy or hard objects in the passenger compartment or trunk unless they are firmly secured in place. We recommend that all infants and children be properly restrained using the infant or child restraint systems at all times while the vehicle is in motion. Always use a child restraint system that is compatible with BabySmart™ on the frontpassenger seat. The use of infant or child restraints is required by law in all 50 states, the District of Columbia, all U.S. territories and all Canadian provinces. Infants and small children must be seated in an appropriate infant or child restraint system recommended for the size and weight of the child. The infant or child restraint system must be properly secured in accordance with the manufacturer's instructions. All infant or child restraint systems must comply with U.S.
Federal Motor Vehicle Safety Standards 213 and 225 and Canadian Motor Vehicle Safety Standards 213 and 210.2. An information label on the child restraint system indicates whether it meets these standards. This confirmation can also be found in the installation instructions that are included with the child restraint system. If an infant or child is traveling in the vehicle: ► Secure the child with a child or infant seat restraint system appropriate to the age and weight of the child. ► Make sure that the infant or child is properly secured at all times while the vehicle is in motion. Never release the seat belt buckle while the vehicle is in motion, since the special seat belt retractor will be deactivated. Installing a child restraint system: ► Always comply with the manufacturer's installation instructions. ► Pull the seat belt smoothly from the seat belt retractor. ► Engage the seat belt tongue in the belt buckle. Activating the special seat belt retractor: ► Pull the seat belt out fully and let the seat belt retractor retract it again. ► Push down on the child restraint system to take up any slack. Removing a child restraint system/ deactivating the special seat belt retractor: ► Always comply with the manufacturer's installation instructions. ► Press the release button on the seat belt buckle. ► Guide the seat belt tongue into the belt outlet. WARNINGM< Children that are too large for a child restraint must travel in seats using normal seat belts. When installing the child restraint system, make sure that the seat belt for the middle seat does not get trapped. The seat belt could otherwise be damaged. ISOFIX is a standardized securing system for specially designed child restraint systems on the rear seats. Securing rings for two LATCHtype (ISOFIX) child restraint systems are installed on the left and right of the rear seats. Secure non-LATCH-type (ISOFIX) child restraint systems using the vehicle's seat belt system. When installing child restraint systems, you must observe the manufacturer's installation instructions. ► Install the LATCH-type (ISOFIX) child restraint system. 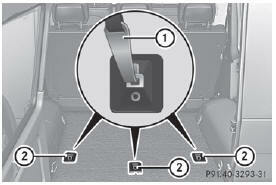 Comply with the manufacturer's instructions when installing the LATCH-type (ISOFIX) child restraint system. ► When a LATCH-type (ISOFIX) child seat securing system is installed, make sure that the center seat belt in the rear compartment is fully functional and can move freely. Only use the described top tether anchorage rings for the respective child seat. Other lashing eyelets could tear in case of an accident. Make sure the top tether straps are not crossed or twisted and the hook is attached and closed properly. ► Remove cargo compartment cover . ► Move the head restraint upwards. ► Install the LATCH-type (ISOFIX) child restraint system with Top Tether. Comply with the manufacturer's installation instructions when doing so. 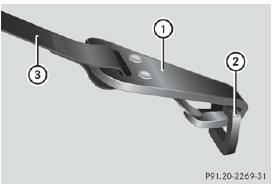 ► Route Top Tether belt 3 under the head restraint between the two head restraint bars. ► Attach Top Tether hook 1 to Top Tether anchorage 2 on the cargo compartment floor. ► Hook Top Tether hook 1 of Top Tether belt = into Top Tether anchorage 2. • Top Tether hook 1 is hooked into Top Tether anchorage 2 as shown. • Top Tether belt 3 is not twisted. ► Make sure that Top Tether belt 3 is not twisted. ► Tension Top Tether belt 3. Comply with the manufacturer's installation instructions when doing so. ► Move head restraint back down again slightly if necessary . Make sure that you do not interfere with the correct routing of Top Tether belt 3.